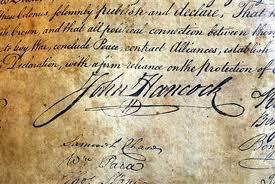 the flourish of John Hancock’s (1737-1793) eponymous signature is well-known and highly recognizable. 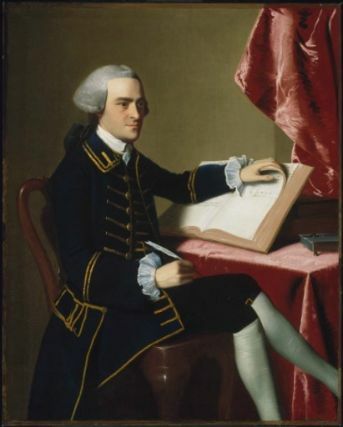 the graceful, Restrained Luxury epitomized in John Singleton Copley’s 1765 Portrait (Museum of Fine Arts, Boston) Captures the moment before Hancock begins his political Journey. 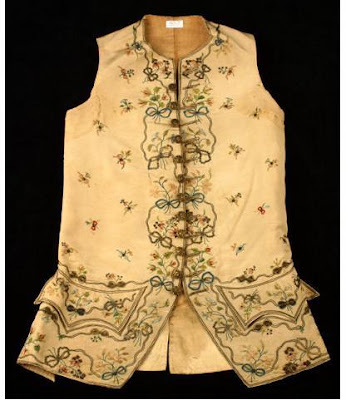 We are fortunate that detailed Likenesses (including clothing and other accoutremonts), contemporary accounts and garments have survived and are available in the public domain. At the Bostonian Society (www.BostonHistory.org), Hancock’s red silk Velvet jacket, c.1780s, possibly worn for his gubernatorial inauguration; at the New York Historical Society (www.nyhistory.org), an elaborately embroidered silk waistcoat, c.1780s (attributed), and, at the Lexington historical society (www.Lexingtonhistory.org), a second, simpler, waistcoat. The Proceedings of the Bostonian Society Annual meeting, 1912 (p.41) records the following: “Court Suit. 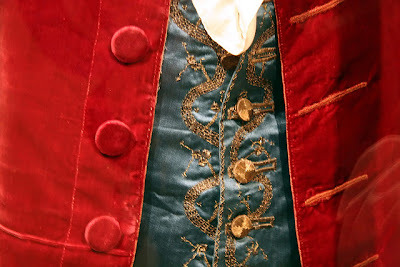 Crimson velvet body-coat, blue satin waistcoat embroidered with gold and drab silk trunks, formerly owned and worn by Governor John Hancock.” The items were given by Franklin Hancock of Haverhill, MA. 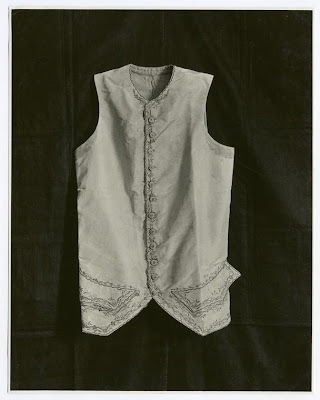 “He seems to have been the leader of fashion--Genteel aristocrat of the day: As a young man ‘He wore a coat of scarlet, lined with silk, and embroidered with gold, white satin embroidered waist coat, dark satin small-clothes, white silk stockings, and shoes with silver buckles.’ It seems that this attire with the ‘three cornered gold laced hat constituted the gentleman of the period.’ His equipage, a coach and six blooded bays, were such as had never been seen in Boston. 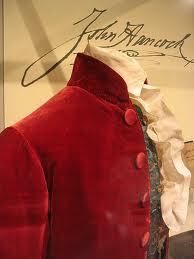 Yes, I remember John Hancock's "scarlet coat with ruffles on his sleeves" well. It's on display at Boston's Old State House, and I talked about it all the time on my Super Duck Tours.